Jewelry Appraisal Services for The Villages, Leesburg and Ocala Florida. 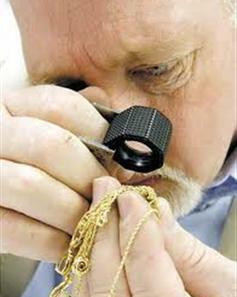 Types of Jewelry Appraisals-Insurance, Fair Market, Estate and Liquidation. Thinking about selling your jewelry, or just curious about what it may be worth? Jewelry Consultation Services are basic opinions offered by the appraiser and can help you make an informed decision. Certificate Verification: Authentication of a certificate or other documents,and a basic examination to confirm the certificate descriptions match the item. Jewelry Box Consultation: Basic examination of multiple items to determine a preliminary opinion as to identity, overall quality, and value. Re-sale Consultation: Examination of an item, preliminary opinion as to identity, overall quality, and recommendation as to how to sell the item, and a reasonable price expectation. Customs or Inventory Report: A dated written inventory of items providing brief descriptions, (no stated value) and a digital image to prove possession as of a specific date. Damage report: A dated written report detailing the type and extend of damage to an item, to be submitted in an casualty loss insurance claim. Jewelry consultation fees are based on the current hourly rate of $90.00 one hour minimum, plus any trip fee’s. Independent jewelry appraisal services in and around Jacksonville, Florida. We are certified gemologists offering onsite jewelry appraisals and consulting services.